The men of Ladyfinger, from left, are Pat Oakes, Dan Brennan, Chris Machmuller and Jamie Massey. The evolution of Ladyfinger can be heard from the first track of the band’s new Saddle Creek Records release, Errant Forms. “Renew” opens with brittle, electric guitar chords before the rhythm section of drummer Pat Oakes and bassist Dan Brennan slides beneath warm keyboards, Jamie Massey’s smokey, twirling guitar and frontman Chris Machmuller’s cool growl. If it sounds “pretty” compared to the howling noise of Ladyfinger’s early years that’s because it is. Still, the music is no less bracing or powerful, just easier to grasp in its clarity. A brief history: Ladyfinger (also known by the legal restriction Ladyfinger (ne)) formed in 2004 out of three other bands: Massey from Race for Titles, Machmuller from Bleeders for Treats, and Oakes and bassist Ethan Jones from Putrescine The original foursome produced two albums, Heavy Hands and the 2009 followup, Dusk. After that, Jones left Ladyfinger to be replaced with “new guy” Brennan, formerly of rock band The ’89 Cubs. Back to the present: Better singing means understandable lyrics. Good thing Machmuller knows how to tell a story. 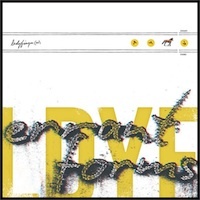 On Errant Forms‘ first single, “Dark Horse,” he spins a non-autobiographical yarn about a wild, irresponsible party hound who’s “looking for a road I ain’t ever gonna find” but finds it when he discovers his wife or girlfriend is carrying his baby. Coincidentally, Machmuller discovered his wife was in a “family way” shortly after writing the song. Then there’s “Galactic” — also not auto-biographical…probably. The brutal rocker describes a guy who picks up signals in his head — numbers and images — obviously messages about an alien coup, which he explains with the line: “I’m a space invader and I think I can save this planet from galactic destroyers from space.” Rush’s 2112 has nothing on these guys. Like their previous albums, Errant Forms was recorded by their old pal Matt Bayles, whose track record includes working with Mastodon, Minus the Bear, Pearl Jam and fellow Saddle Creekers Cursive. Working with such an accomplished producer puts pressure on the band, Oakes said, especially when the band isn’t sure it’s ready to enter the studio. Good thing he likes these guys. While the way they make records hasn’t changed much, the way the band and label sells them has. In the old days bands simply released records and hit the road, hoping college radio and good reviews piqued people’s interest. Things like first single “Dark Horse” being selected as the “Daily Download” at rollingstone.com, where readers can listen to and download the track for free. Massey credited Saddle Creek’s Jeff Tafolla, in charge of licensing and new media, for the increased exposure, including Errant Forms being available as a digital stream from taste-making music blog AbsolutePunk.net. But these new-fangled sales methods go beyond blogs. Tafolla suggested Ladyfinger launch a Twitter account (@ladyfingerne) as well as a Facebook page (@facebook.com/ladyfingerne). Saddle Creek says Ladyfinger’s combined sales for their past two releases was somewhere north of 1,200 units, far from what’s needed to make a living. All four band members have day jobs. Brennan, 34, is a sound engineer at The Slowdown when he isn’t on the road working sound for bands like Cursive. Massey, 37, is an art director at Turnpost Creative Group and proprietor of The Sydney in Benson. Machmuller, 32, launched Workers Take Out and now runs O’Leaver’s Pub, while Oakes, 35, is a production manager at Ink Tank Merch, a custom screen printing company owned by Saddle Creek. With families to support and a music industry in decline, why keep putting out records? Ladyfinger plays with The Seen and Hussies this Friday, Feb. 1, at The Waiting Room, 6212 Maple St. Tickets are $8. Show starts at 9 p.m. For more information and tickets, go to onepercentproductions.com. “The Thermals are pleased to announce they have signed to Saddle Creek, a label the band has known and admired for many years. The Thermals and Saddle Creek have a long history of sleeping on floors together: The Thermals have toured with Cursive and Ladyfinger, and Hutch and Kathy organized the first Bright Eyes show in Portland way back in 1999. “The band formed in 2002 and has released five records and toured 15 countries. The Thermals’ sixth LP and debut for Saddle Creek, Desperate Ground, will be released April 16 and is available now for pre-order at the Saddle Creek Online Store. The album was produced by John Agnello (Dinosaur Jr, Sonic Youth) in Hoboken, NJ. Agnello and The Thermals completed the record and evacuated the studio just hours before Hurricane Sandy ravaged New Jersey, a fate quite fitting when you consider the product. 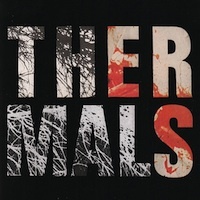 Desperate Ground is a true scrappy and scratchy return-to-form for The Thermals, with all the raw power and unhinged adolescent energy that made their early LP’s so insanely enjoyable. The only Thermals album I’ve owned was More Parts… which reminded me a ton of Superchunk. I haven’t heard their last couple of albums. 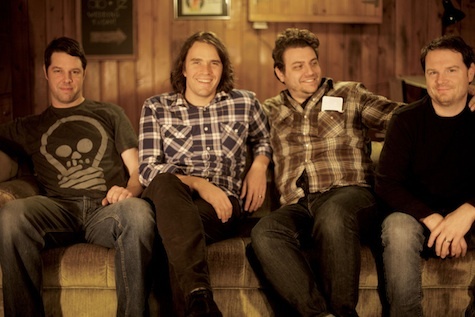 After 2008’s “Returning to the Fold” single, the band jumped ship from Sub Pop (or was pushed) and landed at Kill Rock Stars for two more LPs, the last of which was Personal Life in 2010. The Thermals are no strangers to Omaha stages. They last played in Omaha at The Waiting Room in May 2011. Before that, they played Slowdown Jr. in April 2009, and before that, Sokol Underground with Thunder Power back in November 2007. The Whipkey Three opens tonight for touring Columbus, Ohio band Red Wanting Blue (Fanatic/EMI/Caroline) at The Waiting Room. $10, 9 p.m.